On Monday, June 2, the EPA is expected to release a draft standard to limit carbon emissions from existing fossil-fired (primarily coal and natural gas-fired) power plants. New UCS analysis shows that a strong standard provides an opportunity to cut our power sector emissions in half by 2030, with renewable energy and efficiency playing a significant role in driving the emissions reductions. Those reductions can be achieved cost-effectively and reliably by ramping up renewable energy and energy efficiency, with the overall benefits of a transition to cleaner energy far outweighing the costs. Our analysis demonstrates how the electricity sector could make sharp reductions in carbon emissions by combining a carbon standard with a targeted set of renewables and efficiency policies. We did not examine the EPA carbon standard per se, since our analysis was conducted prior to the release of the EPA’s draft rule. We ran three scenarios in our modeling analysis: a Reference case scenario that assumes no new state or federal policies beyond those which existed at the end of 2012; a Carbon Standard + EERE Case that combines a limit on carbon emissions with strengthened renewable energy (RE) and energy efficiency (EE) policies; and a Carbon Standard Case with only the limit on carbon emissions. For more details on these scenarios, please see the ‘Modeling Scenarios’ section at the end of this post. In the carbon standard + EERE case, power sector carbon emissions are projected to fall 40% below 2013 levels by 2020 and 54% below by 2030, compared with 20% below 2013 levels by 2020 and 37% by 2030 under the carbon standard case. However, under the reference case, electricity sector emissions slowly climb back up and are 5 percent higher than current levels by 2030. The U.S. electricity sector is in the midst of significant changes. In the last few years a record number of coal-fired power plants have been retired because of market conditions, including low natural gas prices, falling demand, declining prices for renewable energy technologies, and health-based standards to limit air pollution from power plants. Natural gas generation has grown considerably to replace coal, alongside an increase in renewable energy and energy efficiency. While these trends have reduced power plant carbon emissions to their lowest levels since 2005, our results bear out the fact that the decline in emissions is unlikely to continue without additional policies. Combining a carbon standard with EERE policies allows states to take greater advantage of these cost-effective options for complying with carbon limits, and helps achieve earlier and much greater emission reductions. Since cumulative emissions are what matter for atmospheric concentrations of CO2 and for climate change, the carbon standard + EERE case is preferable as a way to limit the emissions that drive future climate change. By 2030, the carbon standard + EERE case cuts 5.1 billion metric tons more CO2 emissions cumulatively than under the carbon standard only case (see cross-hatched area in chart above). A key factor in driving the emissions reductions is a transition away from coal to cleaner generation sources like natural gas, wind and solar energy, as well as energy efficiency. With the costs of renewable energy falling, our carbon standard + EERE case shows that renewable energy grows from 6% of the energy mix in 2013 to 14% by 2020 and 25% by 2030. Coal’s share of electricity generation declines to 12% by 2030 and natural gas grows to 30% by 2030. We see a diverse mix of renewable energy deployed, with wind being the dominant resource. Solar energy and biomass also play an important role. Our carbon standard + EERE case also shows that energy efficiency policies are projected to reduce U.S. electricity demand 9% below reference case levels by 2020 and 17% by 2030. The combination of a carbon standard and strengthened renewable energy and energy efficiency policies helps ensure both a transition away from coal, as well as a contained role for natural gas. With only a carbon standard, in 2030 natural gas generation is 23% higher than under the carbon standard + EERE case. Natural gas plays an important role as we transition to a cleaner generation mix. For example, fuel switching from coal to natural gas can contribute to near-term carbon reductions and increase the flexibility of the grid to integrate higher levels of renewables. But ultimately natural gas is still a fossil fuel and an unbridled use of natural gas comes with significant climate, health, economic, and environmental risks. And because new investments in power plants can last 40 years or more, the policy and investment choices made in the next few years will largely define the shape of the U.S. power sector – and its emissions – for decades. By deploying more renewable energy and efficiency resources to cut emissions and meet our power needs, we can also help to minimize the risks of over-relying on natural gas. Our analysis shows that the overall societal benefits of the carbon standard + EERE case are much greater than the costs. 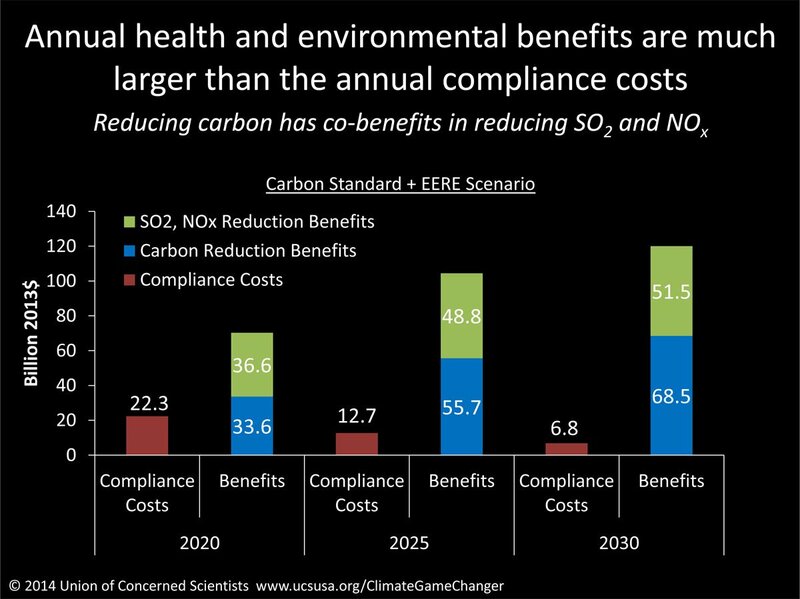 In 2020, the benefits – which we calculated as the monetized benefits of CO2, SO2, and NOx reductions – outweigh the compliance costs by a factor of 3:1. In 2030, benefits are even greater, outweighing costs by a factor of 17:1. The emissions reductions have only a modest impact on electricity bills because of the affordability of low-carbon options. Energy efficiency in particular helps offset price impacts by lowering demand so that the net impact on electricity bills is minimal. What do our results mean for the EPA’s draft proposal? Our results show that it is possible to cut our our power sector emissions in half by 2030. The best opportunity to make these reductions is switching quickly to cleaner energy resources, especially renewables and energy efficiency. A carbon standard that requires deep emissions reductions both in the near term and the long term, provides the flexibility to include renewables and energy efficiency as compliance options, and encourages a multi-state approach to achieving reductions could go a long way toward achieving the potential our analysis highlights. In addition, states can further the opportunity for cost-effective emissions reductions by strengthening their renewables and energy efficiency policies or implementing carbon caps or carbon pricing programs. State carbon reduction programs that generate revenues could provide resources for transition assistance for workers. While the EPA’s draft proposal may include many of these elements, our analysis points to opportunities to set a strong standard when it is finalized in June 2015. The EPA’s draft proposal for a power plant carbon standard is a significant step forward in curtailing the emissions that fuel climate change. The next step is ensuring they live up to their full potential, and you can be part of the effort to make that a reality — and you can start by sharing the infographic below! We used the 2013 version of EIA’s National Energy Modeling System (NEMS) for our analysis. To create a baseline against which to measure our results, we first ran a Reference case scenario based off EIA’s Annual Energy Outlook 2013 reference case, with updated cost and performance assumptions for some energy technologies to match real-world data. This case shows what the emissions profile and generation mix of the electricity sector would look like if there were no new state or federal policies beyond those which existed at the end of 2012. Next, we modeled a scenario that combines a limit on carbon emissions with strengthened renewable energy (RE) and energy efficiency (EE) policies (called the Carbon Standard + EERE Case). The carbon standard was modeled via a modest carbon fee starting at $5/metric ton in 2018 and rising to $35 in 2030. Note that the EPA is very unlikely to impose such a fee but states could adopt an approach like this either on their own or in cooperation with other states. Indeed a carbon price is already in effect in the nine Northeast RGGI states and California. Great River Energy Cooperative, Minnesota’s second-largest electric power supplier, also recently proposed a regional carbon cap accompanied by a fee as one possible way to meet the upcoming standards. The additional EERE policies we modeled are, for the most part, policies that states could implement on their own as part of their compliance strategy, such as adopting or strengthening renewable electricity and energy efficiency resource standards, updating residential and commercial building codes, and providing incentives for more efficient equipment and combined heat and power plants. We also included a limited role for complementary renewables policies such as a short-term extension of the federal Production Tax Credit (PTC) and solar Investment Tax Credit (ITC), and new lower cost financing mechanisms like Master Limited Partnerships (MLPs) and Real Estate Investment Trusts (REITs). We also analyzed a case with only the limit on carbon emissions (called the Carbon Standard Case). 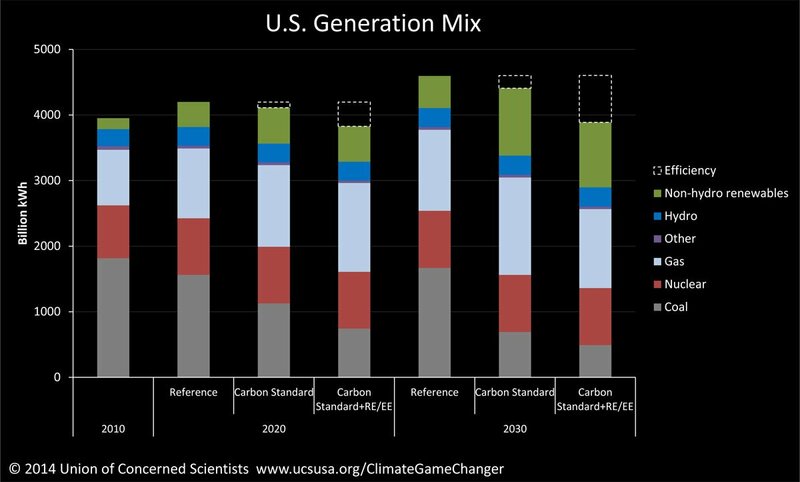 These scenarios provide insights into how the U.S. electricity generation mix, power plant emissions, electricity costs, and societal benefits would change in response to either a strong carbon standard alone or one combined with enhanced renewable energy and energy efficiency policies. Learn more about our methodology and assumptions. Thanks for a readable summary of this crucial info. I plan to send a link to my Senators and my Rep in the House from California so they can read it as well. Although all three are strong supporters of renewables and energy efficiency, this info will confirm their positions. I hope other readers of this post will do likewise.